At Toru's headquarters, he receives a call from his spy who reports Karai and the mutants heading into the cave. Toru orders his forces to execute them if they make it back out. Overhearing this, Natsu accuses her grandfather of being dishonorable, but he scolds her for being naive (and also conveniently drops exposition about Natsu's parents being killed because they were too honorable). He tells Natsu that Karai was a threat that he needed to eliminate, so he sent her on the wild goose chase to find the magic sword just so he could have her ambushed and killed. Whether or not she found the sword was immaterial. Natsu storms out and Toru warns her that she won't be welcomed back. In the cave, Karai, Koya and Bludgeon are approached by a bunch of Disturbed album covers. 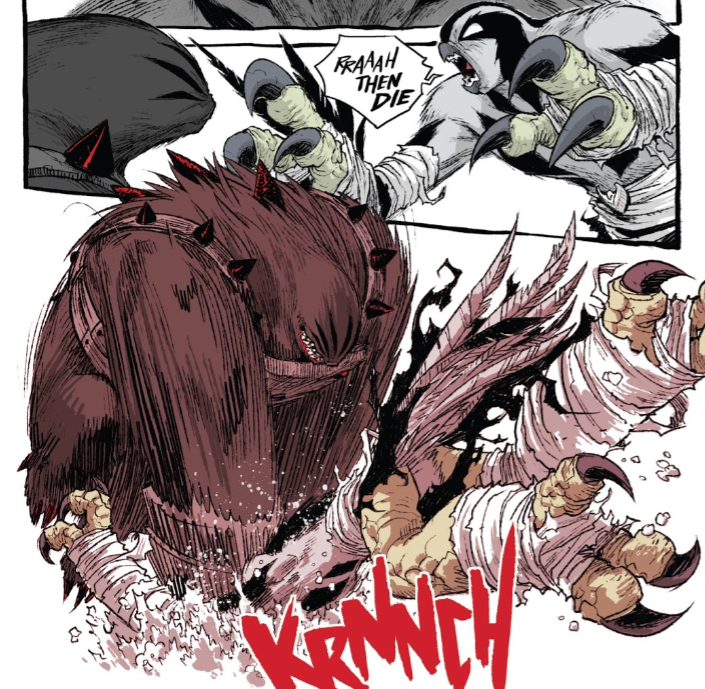 The evil spirits cannot attack except in retaliation, so they begin taking provocative forms, like the Shredder and the Turtles, to provoke them into reacting. Karai and Bludgeon ignore the taunts, but Koya begins getting irritable when a zombie-Leonardo mocks her inability to fly. Meanwhile, Natsu sneaks into Karai's apartment and warns Toshiro of her grandfather's ambush. Toshiro is inclined to believe her, but insists that she come along with him so they can warn Karai together. Down in the cave, Koya snaps and attacks a zombie, giving the horde of the undead license to pounce. Karai leads her team into the next chamber and Bludgeon seals the entrance with a stone slab so the zombies cannot give chase. They find the sword at the other end of the chamber, but their path is blocked by a huge, three-eyed mutant mole named Ocho. In the early 14th century, she was a human woman, but Kitsune cursed her to be a mole and guard the sword until someone worthy could claim it and return it to the heavens. 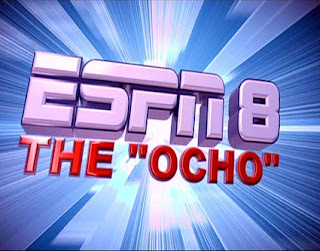 Karai insists on fighting Ocho alone, but Ocho trounces her. Finally, she asks Bludgeon to give her a Fastball Special and he hurls Karai over Ocho's head. Koya is still at Bludgeon's throat as he tries to convince her to fight the talisman's influence. She becomes distracted when Ocho emerges from the earth and beckons her to do battle. 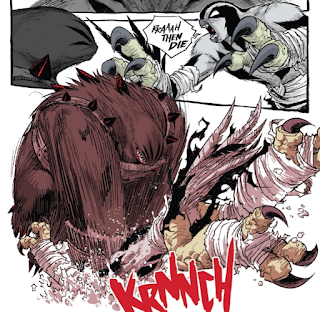 *This story is continued from TMNT Universe #13. The story continues in TMNT Universe #15. *This issue was originally published with 3 variant covers: Cover A by Freddie E. Williams II, Cover B by Sophie Campbell, and Incentive Cover by Leila Del Duca. Zombies? Now you've really got my attention. And a giant three-eyed mole-woman? Aw, you shouldn't have. 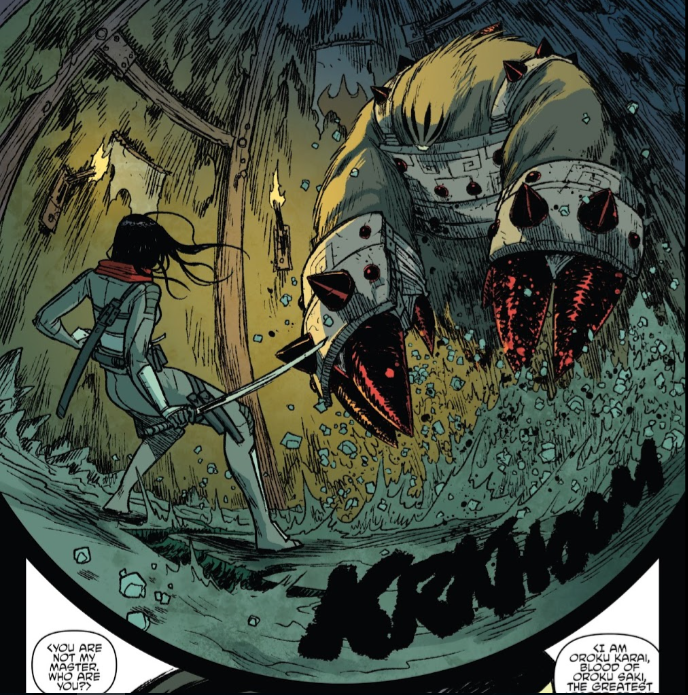 Part 3 of "Karai's Path" has a lot of "cool stuff" in it, and I liked all that "cool stuff", but the "cool stuff" almost seems more a measure to create misdirection from some of the stock characterizations and predictable heel-turns that dot the other half of the issue. Natsu and Toru's conversation about that old Japanese caricature cliche, "honor", was just a little bit excruciating. The grizzled old timer thinks honor is for the naive, but the hip youngster believes there's still room for honor in this world. She'll show HIM! Also, there's that little info-dump where he reminds her that her parents are dead, because God knows, whenever you or me get into an argument with someone, they have to recite our life story back to us in case we forgot. Of course, I complain about that now, but I'm sure I'll welcome it when I have Alzheimer's. I'm beating up on this story a bit much, and that's not really fair. It still has all that cool stuff I was talking about. While the zombie scenario played out as we'd expect it to, there's no denying that the pencils and especially the colors on that sequence looked superb. Koya being the one to fold under pressure went as anticipated, but what, did anybody reading NOT want someone to screw up and make the zombies attack? What kind of comic would this be if we didn't get a zombie attack? Though with the way Koya's been portrayed in this story arc, I'm thinking "Karai's Path" should have more accurately been titled "Koya Ruins Everything". The effect used for Bludgeon's "sight beyond sight" is something in-between the "white silhouette floating in negative space" approach Jim Lawson loves and the heat signatures from Predator. Maybe not the most innovative visual, but it has it's moments. There's a panel where Bludgeon "sees" Ocho, but he can make out the silhouette of the human woman tethered to the figure of the mole monster. What was nice was that the moment was left entirely up to the visual; no dialogue from Bludgeon describing what he was sensing or anything redundant like that. Ocho is a big scary three-eyed mole monster. I dunno; not much else to say, other than I dig the design and tying her into Kitsune's time menacing ancient Japan was a nice touch. She mentions that she derives her name from the Ocho Period, one of Japan's shortest (spanning 1311 to 1312). I dunno if there's any underlying significance to that, like maybe she won't be around for very long, but I have a tendency to read into things. Oh, and raise your hand if you've seen Dodgeball. The back-up consists of Koya getting punched a lot by Ocho. Hm. 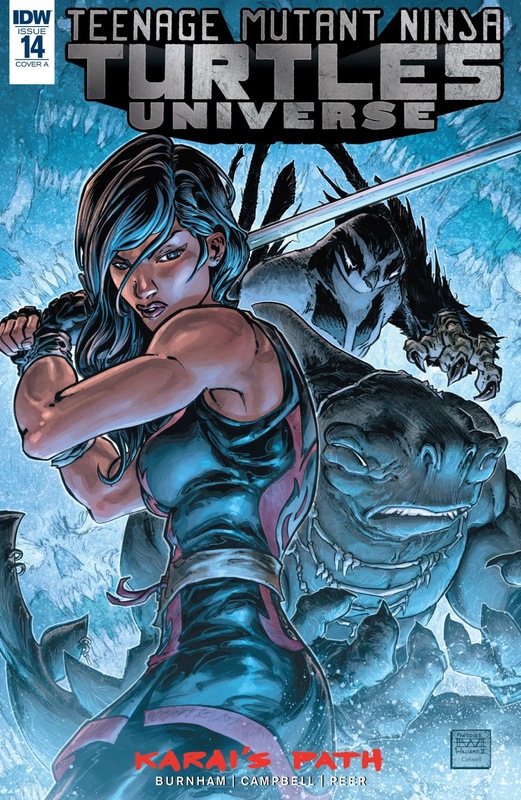 I'm thinking "Prey" will read a lot better altogether and as a sequel/epilogue to "Karai's Path". Breaking it up and running it in tandem with the story it is intended to narratively follow hasn't been doing it any favors. If I had any other thoughts on this issue, I suppose it's that Karai could really use some rhinoplasty. Overall, it is an interesting comic. 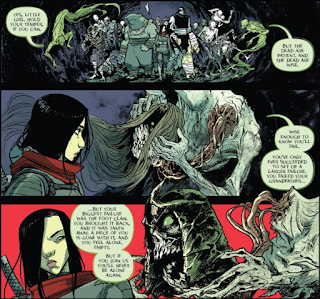 I like the zombie vision going on here because it reminds me of when Splinter had that moment with the Rat King in the Mirage Comics. However, it seems that Koya is the only one that needs to mature. Karai seems to be under control with her feelings when she really needs to struggle through this in order to discover herself. Does that mean she has figured out a path for her future or is she just more in control of her emotions? 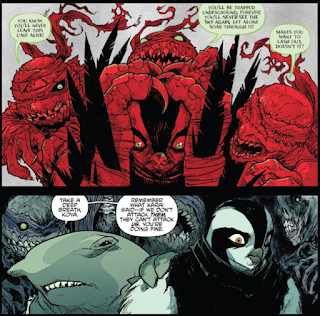 The zombie Turtles look cool and I wouldn't mind IDW making a Zombie universe similar to Marvel's Zombies. Maybe they can make the protagonist an alternate version of Shredder that wants to save the world from the Zombie Turtles.